This well earned reputation is evident by the achievements of our staff and student body. In upholding our unmatched record of contest wins, Capri continues to train our students to be the best! 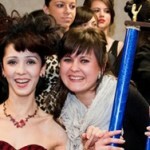 In 1998 alone, our students earned 11 awards, including the International Beauty Show in New York, N.Y. Capri’s design team travels all over the world to keep abreast of all the latest trends and superior designs to bring home and produce the most accomplished student competition team in the area. 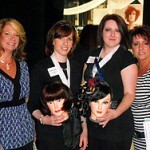 The first ever Emiliani Student Competition of 2010 brought students from over 60 cosmetology schools in the Tri-State Area together to compete for Top Honors. Capri Cosmetology Learning Centers student Kristen Batewell came away in First Place. Again in 2011, we were thrilled to announce our achievement at the October 17th, 2011 Emiliani Vision Becomes Reality Student Competition. Capri Cosmetology Learning Centers’ Tylon Drummond took first place in this year’s competition. Two years in a row Capri Cosmetology has taken first place in the Emiliani student competition. 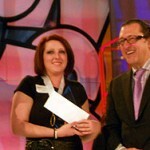 The competition consisted of 10 finalists from different cosmetology schools in New York and New Jersey. All contestants were judged based on their futuristic vision, imagination & creativity. Tylon won $600 and a $100 education certificate for classes at Emiliani. Capri commends all of the contestants for their hard work and fantastic jobs creating that “Futuristic Look”. We are delighted to have Tylon Drummond take first place in this year’s competition! Congratulations Tylon Drummond on your incredible work! The next SalonCentric Competition held in 2012 themed ” Decades of Fashion” had three finalists from Capri Cosmetology Learning Centers. Top Honors were awarded to Capri Cosmetology Graduate Michael Delfino, making it three in a row! Among our many trophies, one in particular stands high above the rest because we triumphed over the competition team from Puerto Rico, the reigning champion of the previous years. 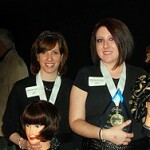 Capri Cosmetology Learning Centers was awarded Overall Winner at the International Beauty Show in New York City. Our students not only separated themselves from the other teams with this high international honor, they also distinguished themselves in student competitions throughout the Northeast. Capri has spent the past four decades of developing award winning student champions. Over the years, salons have repeatedly reported that our graduates are top performers compared to those entering the industry from other schools. Capri Cosmetology Learning Centers is proud to announce that at the 2014 International Congress for Salon and Spa Professionals , Repechage Owner and Founder, Lydia Sarfati, presented Capri Cosmetology Learning Centers’ owner Anthony Fiore with the Presidents Award For Excellance and named 2014 School of the Year!